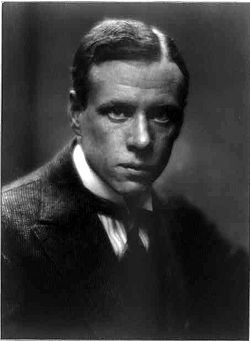 Sinclair Lewis (February 7, 1885 – January 10, 1951) was an American novelist and playwright. He has been called, “the conscience of his generation”  for his satirical portrayals of American cultural manners and mores from small town provincialism to religious fundamentalism. During the “speakeasy” decade of the 1920s, America was “coming of age,” developing an identity that was caught between the old fashioned values of immigrant fathers and the growing materialistic aspirations of a younger generation. Lewis addressed themes that had previously been repressed in novels, such as feminism, racism and fascism. Even the sacrosanct institution of capitalism was jocularly impugned. Like Theodore Dreiser and H. L. Mencken, he sometimes scandalized a nation but in the final analysis he was successful in his social critiques because he believed in the character and heart of America and in its ability to change. In 1930 he became the first American to win the Nobel Prize in Literature for his “powerful and vivid art of description and the ability to use wit and humor in the creation of original characters.” His goal was to write “realistic novels that were truthful,” even while flagrantly spurning his critics. In so doing, he captured the American vernacular and character: the hopes, the dreams, and the glaring shortcomings of a young nation. He was born Harry Sinclair Lewis in Sauk Centre, Minnesota, in 1885. His father was Dr. Edwin J. Lewis and his mother was Emma Kermott Lewis. His mother died of tuberculosis when he was three years old and his father subsequently re-married Isabel Warner the following year. When he was 13 years old, he attempted to run away in order to enlist as a drummer boy in the Spanish-American War. His father nicknamed him "Doodle" after Yankee Doodle for his escapade. He was an avid reader and town legend had it that he read every book in the public library before graduating from high school. Early literary influences included authors Sir Walter Scott and Robert Louis Stevenson. He built a small theater in the barn in back of his house and kept a cast of characters made from keys (which he called "the key people"). He began keeping a diary at age 15, a habit that he maintained throughout life. In 1902 he attended Oberlin College in Ohio where he was involved with Christian youth activities through the YMCA. However, he soon became disenchanted with organized religion. He wrote in his diary, "There are many things as to the Christian religion that make it almost impossible to believe it." He was to remain an agnostic throughout life. From 1903-1906 he attended Yale University where he served as editor of their literary magazine. After some ups and downs on his educational path he received his bachelor's degree in 1908. After college he worked at a variety of odd jobs that included spending two summers on a cattleboat. In 1906 Lewis boarded at Upton Sinclair's Helicon Hall, the experimental utopian community. Like many aspiring writers Lewis began his career freelancing; he sold light verse to magazines like Puck and Life. He wrote short romantic stories about knights and fair ladies. Lewis' first published book was Hike and the Aeroplane published in 1912 under the pseudonym “Tom Graham.” It reflects the fascination young boys of that era had with the growing field of aviation. By 1921 Lewis had six novels published including The Job and The Innocents, however, he once remarked that his first five novels were "failures." Although not commercially successful, his early novels did help to earn him a reputation as a promising new writer on the literary scene. He supported his novel writing by selling short stories that appeared over a period of many years in the Saturday Evening Post alongside the illustrations of Norman Rockwell. He married Grace Livingstone Hegger, "Gracie," an assistant editor at Vogue, on April 15, 1914. The simple wedding was held at the New York Society for Ethical Culture on New York's Central Park West. That same year his novel Our Mr. Wrenn was published. In 1917 his son Wells was born, named after H. G. Wells, an author that Lewis greatly admired and whose futuristic stories gave inspiration to young intellectuals of the era. Lieutenant Wells Lewis was later killed by a sniper in Piedmont Valley, France (near Alsace-Lorraine) during World War II. After traveling throughout the United States, Lewis worked as an editor at George M. Doran and Co. in New York City. Utilizing his knowledge of marketing he urged friend Alfred Harcourt to publish Main Street, even investing in its production. His ambition and forethought paid off: Main Street was to become not only his first commercial success, but a publishing phenomenon in the United States and abroad. Initially, Harcourt, Brace and Howe hoped to sell 20,000 copies of the book but soon sales reached 100,000, and by 1951 it had sold two million copies. The themes of conformity and discontent come under scrutiny in both Main Street and Babbitt, although each protagonist makes different choices in trying to deal with the limitations thrust upon them by small town life and business, respectively. Carol Kennicott in Main Street attempts to "reform" a small town by introducing culture to its citizens. However, she is met mostly by narrow mindedness, if not hypocrisy. George F. Babbitt's malaise takes the form of a mid-life crisis and his choices are more radical, although he attempts to redeem himself through his son. In both books Lewis had both the honesty and courage to highlight the malcontent that many Americans felt with their lives—lives that at least externally were supposed to epitomize the "American Dream." In addressing the books' themes, Lewis's biographer said, "Few American novels have so decisively evoked the lives of thousands of Americans, and some of the truths of that time are as true today." In his review for the literary digest, "The Smart Set," H. L. Mencken praised Lewis's characters as, "... not only genuinely human but also authentically American." Main Street and Babbitt were to be alternately praised and banned as were subsequent books like Elmer Gantry and Kingsblood Royal. In 1926 he won the Pulitzer Prize for Arrowsmith but refused it over philosophical differences with the Pulitzer Prize committee. Lewis always researched his novels extensively, whether he took photographs of Sauk Centre, Minnesota for Main Street or interviewed ministers for Elmer Gantry. Arrowsmith, about an idealistic doctor, shows his in-depth research into the field of medicine. In its time it was compared to A. J. Cronin's The Citadel. In 1928, Lewis and wife Grace, who had been separated for some time, finalized divorce proceedings. Lewis did not remain single long; that same year he married American journalist Dorothy Thompson after meeting her in Europe where she was posted as a foreign correspondent. The couple spent some time in Britain visiting members of the Bloomsbury Group, an intellectual circle devoted to the arts, which included Virginia Woolf and E. M. Forster. Lewis also socialized with American literati, sometimes referred to as the "Lost Generation"—expatriates living in France—which included writers such as Ernest Hemingway and F. Scott Fitzgerald. He was photographed by surrealist photographer Man Ray in the famed Montparnasse Quarter of Paris. The restless Lewis traveled often but always longed to return to America. He and Thompson bought property in Vermont where their son Michael Lewis was born in 1930. That same year he won the Nobel Prize on the strength of his novel Babbitt. Upon winning the prize Lewis wryly commented, "This is the end of me, I can't live up to it." ...in America most of us—not readers alone, but even writers—are still afraid of any literature which is not a glorification of everything American, a glorification of our faults as well as our virtues, [and that America is] the most contradictory, the most depressing, the most stirring, of any land in the world today. Although Lewis' later novels did not have the same impact or popularity of earlier ones, he continued to be productive and creative. His last renowned work was It Can't Happen Here, a speculative novel about the election of a fascist U.S. president. 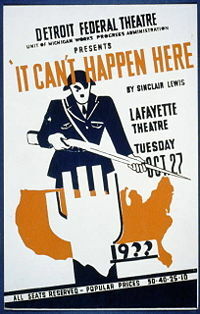 In 1936, Lewis and John C. Moffit wrote a play version, also titled It Can't Happen Here, which is still produced. The stage version premiered on October 27, 1936, in several United States cities simultaneously, in productions sponsored by the Federal Theater Project. He wrote plays and short stories between 1936 and 1942. He even tried his hand at acting in summer stock in various locales such as Williamstown and Provincetown, Massachusetts. Lewis, who was said to have the gift of mimicry, once played the stagehand in a production of Our Town, a popular play written by Thornton Wilder. Over the years he developed a pattern of working to excess and then between novels drinking to excess. Alcoholism and the stress of dual careers took their toll on his marriage and he and Dorothy Thompson divorced in 1942. In 1951 he died in Rome of heart failure, where he was working on his last novel, World So Wide, subsequently published posthumously. At his behest his ashes were interred in the family plot at Sauk Centre, Minnesota. The citizens of his hometown, who long abided droll comparisons to the parodied denizens of Gopher Prairie and Main Street, had enscripted on his tombstone simply Sinclair Lewis: Author of Main Street. Lewis' body of work, whose importance fell out of favor with later critics, has been more highly regarded in recent years. He was often criticized during his career for only complaining and offering no real solutions. However, he influenced a generation of young writers in terms of realistic portrayals and satirical views; authors such as Kurt Vonnegut, John Updike and Tom Wolfe. John Marquand once told Lewis, "Nearly everything I know about writing I have learned from you." All of them looked to the culturally iconic characters he portrayed—larger than life, complex, but in the end, redeeming. Lewis's novels and short stories were adapted many times for either stage or screen. The 1930s classic Dodsworth based on the novel by the same name starred Walter Huston and Mary Astor and received seven Academy Award Nominations. Elmer Gantry starred Shirley Jones, Jean Simmons and Burt Lancaster, who won “Best Actor” for the title role. The further I get from America the more I want to write about my own country. It's surprising how love of your native land seizes you. My real traveling has been sitting in Pullman smoking cars, in a Minnesota village, on a Vermont farm, in a hotel in Kansas City or Savannah, listening to the normal daily drone of what are to me the most fascinating and exotic people in the world - the Average Citizens of the United States, with their friendliness to strangers and their rough teasing, their passion for material advancement and their shy idealism, their interest in all the world and their boastful provincialism - the intricate complexities which an American novelist is privileged to portray. ↑ Sheldon Norman Grebstein, Sinclair Lewis (New York: Twayne Publishers, 1962). ↑ Richard Lingeman, Sinclair Lewis: Rebel from Main Street (New York: Random House, 2002, ISBN 0679438238). ↑ John Hershey (ed. ), Main Street & Babbitt (New York: Library of America, 1992, ISBN 0940450615). ↑ 6.0 6.1 The Nobel Prize in Literature 1930: Sinclair Lewis Autobiography, Nobel Foundation. Retrieved September 4, 2007. Grebstein, Sheldon Norman. 1962. Sinclair Lewis. Twayne Publishers. Hershey, John (ed.). 1992. Main Street & Babbitt. Library of America. Modern Fiction Studies 31(3) (Autumn 1985) – Special issues on Sinclair Lewis. Sinclair Lewis at 100: Papers Presented at a Centennial Conference. St. Cloud University Press, 1985. This page was last modified on 31 July 2014, at 15:07.